If there’s two root vegetables that get me excited on a cold winter night it’s carrots and parsnips. These particular roots taste even better after they’ve experienced a hard frost (which results in them converting their natural starches into sugar). We dug these veggies late last fall after we got a few hard frosts and I’m so happy we waited because they are delicious. The parsnips in particular are amazing this time of the year and this soup is a great way to celebrate their sweet, earthy flavor. 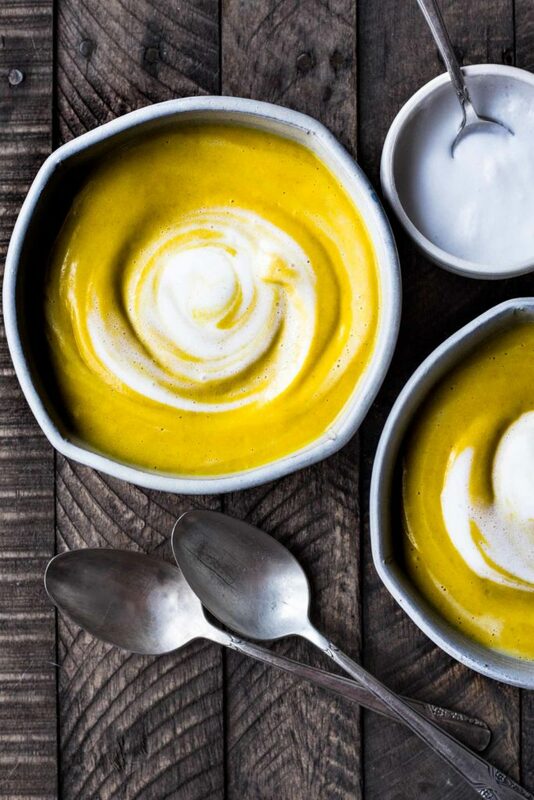 I love this twist on the classic carrot ginger soup because the addition of the parsnips adds another depth of flavor. Between the sweet veggies, pungent ginger, and warming spices this is the kind of soup that will warm you from the inside out. I hope you all love this carrot, parsnip and ginger soup as much as we do. Put on your coziest sweater, pour a glass of wine and head to the kitchen. This was so good! Thank you for posting it. The flavours just sang. this soup was great, I enjoyed the parsnip flavor! My 15 month old son also loved it! I added quinoa in our bowls to make it even more nutritious for us. I will definitely make it again. Super yum–I felt like it needed a little more acid and umami, so I used chicken stock and added a splash of fish sauce and sherry vinegar at the end. The vita-mix was a must! I used this recipe as the base sauce together with chicken and rice – works really well.